Sometimes the only thing that prevents us from doing something is that we're not totally sure how to finish it. For example, today's simple solution is one such issue. 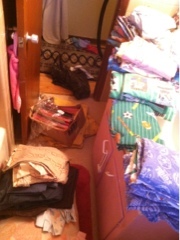 I have been wanting to clean out my linen closet for quite a long time. However, my biggest issue was finding somewhere for all the rejected linens to go! So, today's simple solution is more of a "duh" than an "oh cool". 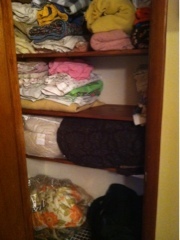 With the help of my husband and a matter of about 1 hour we cleaned out the linen closet. First things first, I spread linens put in the hallway and the bathroom so that we had a good view of what linens we had. Then we selected what we wanted to keep and put it away, including putting king size sheets in our bed trunk in our bedroom and making Annie's bed. 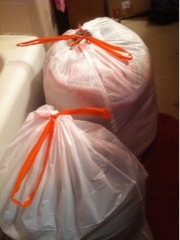 Finally I bagged up items to donate. As you can see from the after picture, I apologize for no before picture, the closet is tidy with room to spare, two giant bags are being donated and several lives will hopefully be positively effected by it. This is my simple solution. When it is time to clean out closets, look around your city or your neighborhood and find an organization to donate the items to. If all else fails, take them to your local Goodwill. Their website, www.goodwill.com has some useful info on evaluating your items for donation. I highly recommend looking first at your church, school or work and supporting the efforts of others in your immediate circles, but if you don't know of such efforts, donation is an excellent next choice.